Can't believe that I forgot to post about this. This is a painting done for a client who is putting together an art book about Sadako Sasaki. I had read the book 'Sadako and the Thousand Paper Cranes' in elementary school so I was familiar with the story and very happy to be asked to participate! 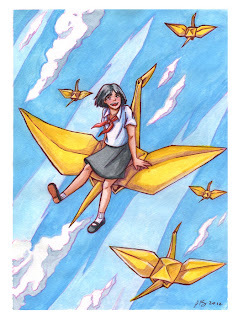 Drawing inspiration from the young heroines of Studio Ghibli movies, I painted Sadako as a happy young girl riding on the back of a paper crane, probably going on magnificent adventures. This painting was done in watercolor on textured watercolor paper and inked with brown tech pens. It had been awhile since I had done watercolors but I'm glad that I wasn't too rusty! I had a lovely time doing this and I can't wait for the book!